Violent at times but the rest of the book is good. When he was little, Luc’s mother told him all about the “mock men” in the forests and told him to stay away from their dwelling. Luc is older now and his mother is dead. He lives in an orphanage working odd jobs in town. One day, a man name Prof comes to town. Luc steals some of Prof’s possessions, but instead of getting mad, Prof hires Luc to go on an expedition with him. Together, Luc and Prof go into the jungle to study the “mock men” or chimpanzees. They both live in the wild and take notes about chimpanzee behavior. While they’re there, Luc and Prof face many dangers but manage to survive. 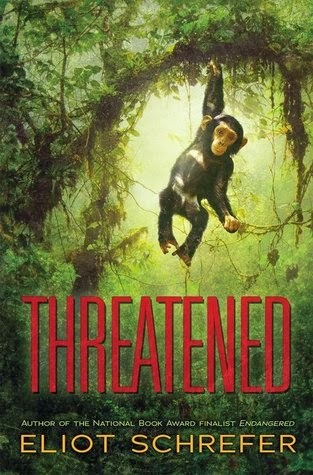 The chimpanzees accept Luc and Prof as part of their family, but soon, some trouble starts. There is a hunter in the jungle who is out to kill the chimps. Will Luc and Prof be able to defend their own family?